“I used to be as fit as a fiddle when I could fetch masses more than 50kg without panting. I never thought I would get this disease!” As for why he got lung cancer, Huynh Cuu who has been specialized in egg business for more than thirty years did not have an idea. However, since it came, he had no choice but actively cooperated with the doctors. Now, facts prove that his treatment has achieved very good curative effect. Huynh Cuu remembered clearly that it was one day in November 2012 when he suddenly felt dizzy. He thought it was an old problem, because he had ten year’s history of hypertension. Based on previous experience, hypertension would also lead to dizziness. However, he didn’t ignore it but immediately went to a local hospital for check. When the doctor told him that there was something wrong with his heart and lungs and advised him to have an overall check in another major hospital, Huynh Cuu started to feel anxious. Accompanied by his wife, Huynh Cuu then had an examination in another major hospital, where he was diagnosed of advanced lung cancer, with tumor in the lung as big as an egg. Being told of that devastating news, the wife was totally shocked and felt very upset. She couldn’t eat well neither could she fall asleep. Meanwhile, Huynh Cuu himself was in a daze. He was so weak that in a very short period of time he lost nearly 40 kg of weight and couldn’t walk by himself. Worried about that he might not bear the brunt, the wife didn’t tell the truth. The whole family started to search the best treatment for Huynh Cuu. Huynh Cuu has a niece who worked in the overseas office of Modern Cancer Hospital Guangzhou in Phnom Penh. She knew the treatment and service of the hospital very well and knew many patients were well treated here. Huynh Cuu took his niece’s suggestion and came to Guangzhou very soon. The clean environment in the hospital as well as attentive medical staffs gave him very deep impressive. 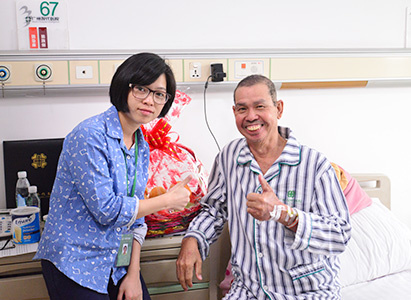 After a complete physical checkup, the oncologists of multidisciplinary team in the hospital had a group consultation and then made out a comprehensive treatment plan for Huynh Cuu based on his personal condition. After the first cryotherapy, Huynh Cuu had slight hemoptysis but it stopped in five days and then his spirit improved a lot, and tumor also shrunk significantly. With his wife’s meticulous care, Huynh Cuu soon regained his weight just like before. Until this moment did the whole family finally relieved. During this return visit, Huynh Cuu had a biological immunotherapy. There was no side effect happened. After that, doctor had a careful examination for him and told him that the curative effect was very good – tumor was inactive and the disease was well controlled. Seeing that, the wife could finally go to shopping happily. Since his illness, Huynh Cuu retired at home and developed some new hobbies such as raising fish and growing flowers. He said that he has grown more than 100 orchids on his rooftop. He likes to see them blooming because those flowers only bloom once every three or four months. When they bloomed, he would move all of them from the rooftop and then sent them back there when they fell. Huynh Cuu now hopes to come back home early and drink tea with his friends. He wants to share his treatment in the hospital to them as well as his experience in China. Some friends have already benefited from his sharing of healthcare tips. In fact, the patient lived in the next ward was introduced by him and now is also in a good condition.